We suspect that just about every food culture on the planet includes something that everyone would recognize as a sandwich. How could it be otherwise? Layered food between two slices of bread makes such good sense and, in its simplest form, a sandwich is the modest layering of flavors with very little fuss. Since plenty of culinary traditions obsess over the sandwich there are lots of complex, crazy sandwiches out there–Ike’s in San Francisco comes to mind. It’d be an impossible, if fun, feat to taste all Ike has to offer, but we do our best to scarf as many of them as possible when the line isn’t around the block. 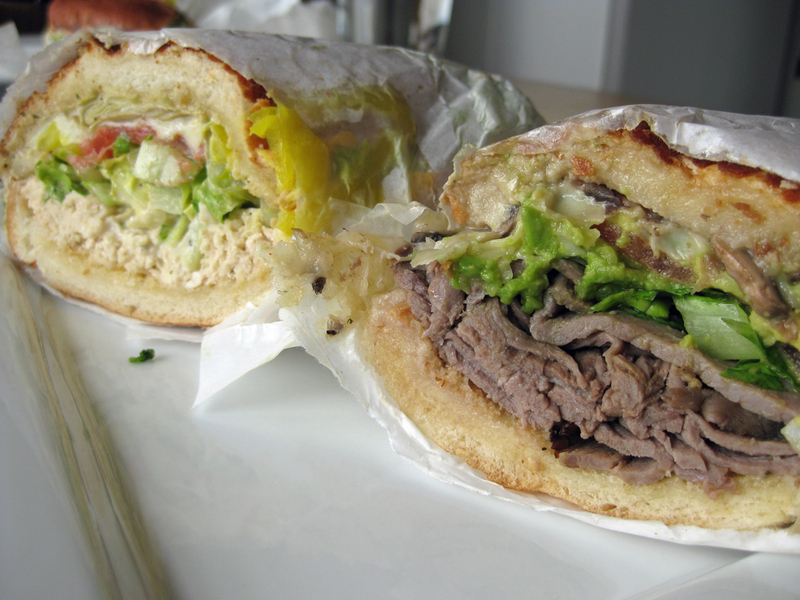 Ike’s sandwiches; 52. Napoleon Complex and 5. Nacho Boy. There’s also some favorites of ours that only taste their best when they are eaten in their home location. From the legendary Central Grocery’s Muffuletta in New Orleans to the Cuban sandwiches (or pan con lechon) in Tampa’s Ybor City to the Vietnamese pate banh mi at the soon-to-open Spice Kit in San Francisco, we’ve tucked into some amazing sandwich joints over the years. But, we have a long way to go in exploring all the great sandwiches in the US. We’ve been hankering for a lobster roll for some time know and need to figure out a good reason to head to Maine. At home, nothing says quick and easy like a sandwich. Cheese, a little Prosciutto or bacon, maybe eggs, tuna, or last night’s chicken and every imaginable combination of condiments form the foundation of too many lunches and suppers to count. A few years ago there seemed to be a craze in the city that has yet to fade. Grilled cheese sandwiches were becoming passé. A new sandwich was hitting the city and this one had grill marks all over it. The panini sandwich was everywhere. Sandwich shops, restaurants, and home kitchens in every corner of the City seemed to have a press or two to make this fancy grilled sandwich. 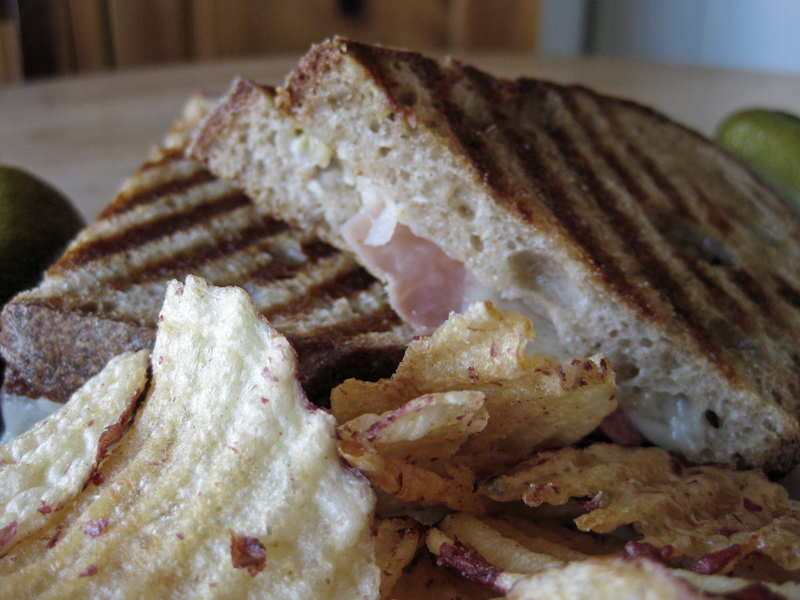 The first panini we ate was at Tartine bakery and we quickly went out looking for a sandwich press. We found one on craigslist.com for $10 and we have used it over and over again. We don’t use it as often as we once did thanks to the the toaster oven we purchased a while back, mostly out of convenience, but when we do pull out the sandwich press we have a few standards that have become favorites of our family and friends. If you’re not up to making your own bread, Trader Joe’s sells a great rustic pain pascal they sell by the half loaf. You’ll need to slice it yourself but that’s simple enough to do. If you have problems with getting things even you can always use your favorite loaf of presliced rustic bread. Just do us a favor and please don’t use Wonder bread. We quit eating that stuff after the age of seven. Preheat the panini maker. Spread the Dijon mustard on one or both pieces of bread. Add the Proscuitto and then the grated cheese on one slice of bread. Top with the other slice of bread, mustard side down. Drizzle a little olive oil on top of the bread. Flip the sandwich on to the panini maker, olive oil side down, then drizzle a little more olive oil on the dry side. Close the sandwich press and grilled for 5-7 minutes depending on the sandwich maker. Preheat the panini maker. Add the chocolate, or Nutella, to one slice of bread. Break up the chocolate so there is just one layer of it and it’s not too close to the edge. Top with the other piece of bread. Spread the butter on one side of the sandwich, flip it onto the panini maker and then spread more butter on the other side of the sandwich. Lower the grill press and cook for 5-7 minutes. Mix the almond meal, Parmesan cheese, olive oil, lemon, and salt together in a small bowl. Add more olive oil if the mixture looks too dry. Spread the mixture on one piece of bread then top with the other piece. Place on the panini maker and lower the grill on to it. Grill for 5-7 minutes. Sometimes you’ll make something over and over before realizing “Hey, there’s a recipe here!” More importantly, others might want to share in one of life’s simple joys. We’ve been having a love affair with a certain Irish cheddar and apricot sandwich for at least a year now with no end in sight. We love it so much that we’ll purchase a couple of pounds of the cheese from Costco about once a month. The taste of this cheddar is great with Jam’s Blenheim apricot preserves and our homemade bread. It’s one of the simplest things to make and, as we’ve recently found out, a favorite of several co-worker’s mothers in Steve’s office. 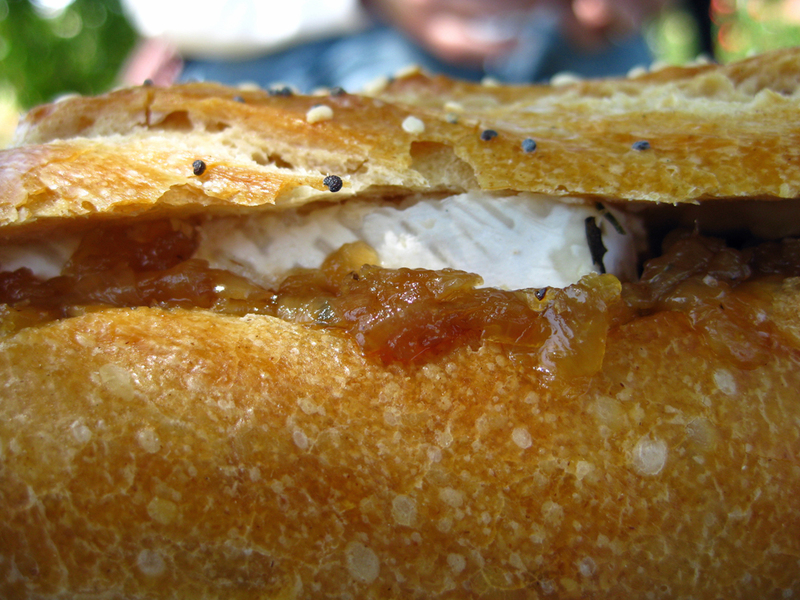 Perhaps this is an old sandwich combination that needs to make a come back. Give it a try and let us know what you think. Another wonderful fruit and cheese sandwich happened by accident as Jason was scurrying about the apartment getting ready for work the other day. With a half of a baguette on top of the fridge from the day before, a couple of peaches that were almost past their prime, and a large tube of goat cheese that had been recently opened, and a big bushy basil plant in the window, Jason assembled a wonderful sandwich. 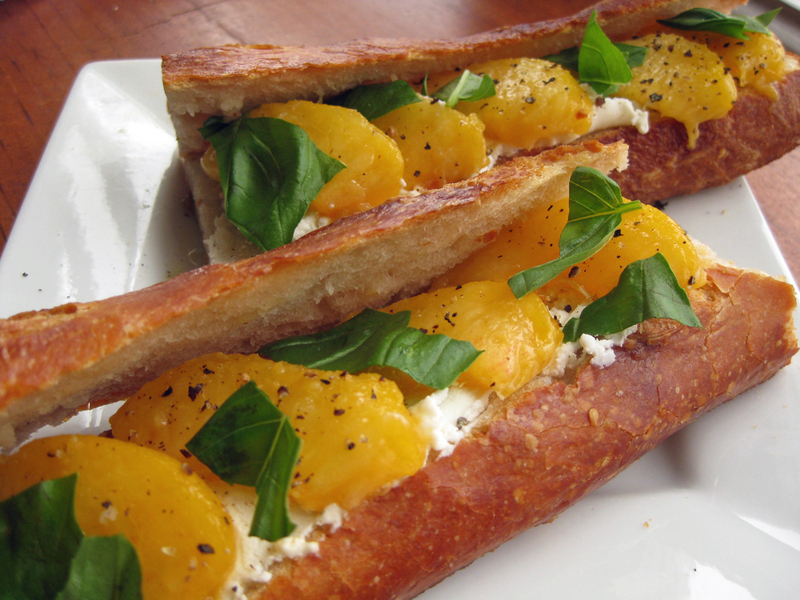 He split the baguette, then spread the goat cheese on one side of the loaf, peeled and sliced the peaches and placed them on top of the goat cheese. Tearing the basil leaves and sprinkling on a grind or two of fresh black pepper was all it took to finish it off. The sandwiched looked beautiful and tasted fantastic. Heat skillet and olive oil over medium high heat. Add sliced onions and sprinkle with salt and pepper, tossing to coat. Reduce heat and cook onions on low for about an hour to 1 1/2 hours, stirring occasionally to scrape up brown bits. When onions have reduced and are caramel brown, add balsamic vinegar. Continue to cook on low for 2-3 minutes until vinegar has been incorporated. Remove from heat and cool. 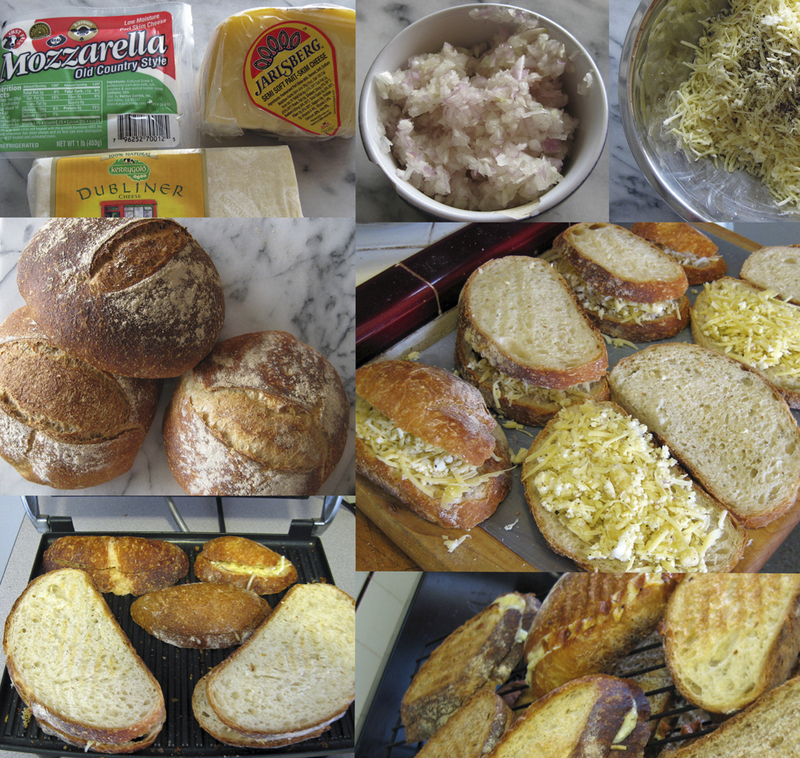 To build the sandwich, slice brie into ¼ inch pieces and place on one side of split baguette in a single layer. Smear caramelized onions on the other side of the baguette. We’ll add more blogs about our love of sandwiches later on, for now, try these quick and easy recipes.